NASA is preparing its first ever mission to deflect an asteroid, a move the space agency hopes will provide lessons for how Earth can be protected from a potentially planet-destroying impact. 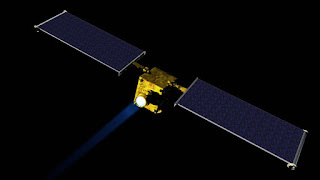 The spacecraft for the Double Asteroid Redirection Test (DART) is now moving to the design phase, and aims to demonstrate the "kinetic impactor technique" in which it will strike an asteroid and physically knock it into a different flight path. The Didymos asteroid - named after the Greek word for "twin" - is being targeted because it is an asteroid binary system which consists of two bodies orbiting each other as well as the Sun. Didymos A is the larger body, and is about a half mile across (780 metres) with the smaller body, Didymos B, being only 530 feet across (160 metres). "A binary asteroid is the perfect natural laboratory for this test," said Tom Statler, programme scientist for DART at NASA Headquarters. DART would fly to Didymos and use an on-board autonomous targeting system to aim itself at the smaller body. The size of a refrigerator, the spacecraft would then strike Didymos B at about nine times the speed of a bullet or 3.7 miles per second (6km per second). "Earth-based observatories would be able to see the impact and the resulting change in the orbit of Didymos B around Didymos A, allowing scientists to better determine the capabilities of kinetic impact as an asteroid mitigation strategy," said NASA. "DART is a critical step in demonstrating we can protect our planet from a future asteroid impact," said Andy Cheng of The Johns Hopkins Applied Physics Laboratory in Laurel, Maryland, the DART investigation co-lead. "Since we don't know that much about their internal structure or composition, we need to perform this experiment on a real asteroid. "With DART, we can show how to protect Earth from an asteroid strike with a kinetic impactor by knocking the hazardous object into a different flight path that would not threaten the planet."